Even at CCSC there appear to be signs of spring with the runway dry enough and the weather cooperating to permit flights both days this past weekend. Don’t delay, fly while the conditions permit. An early start enabled us to get in two currency flights prior to the scheduled meeting of CCSC Instructors. Since everyone else needed an annual field check, operations halted until after the instructor’s meeting. Then we got in three more flights before the rain shut things down for the day. 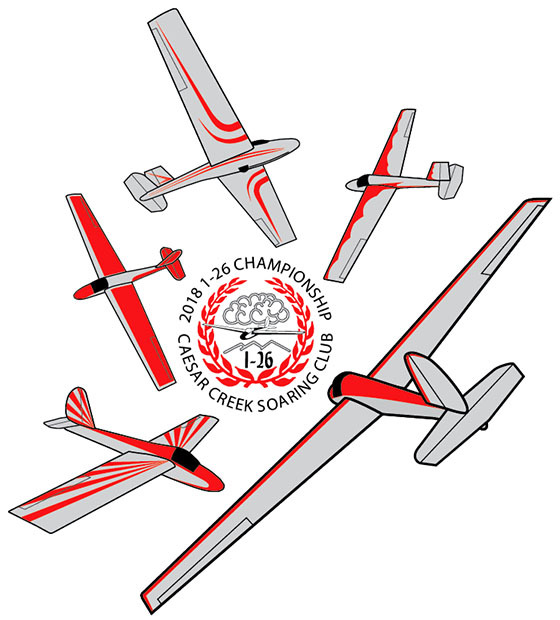 Last week the FAI Gold Badge distance requirement of a 300-km (186.4 mile) flight was shown to be routinely accomplished by CCSC members flying from our home gliderport. The other requirement for the Gold Badge is an altitude gain of 3,000 meters (9,843-feet). Is that even possible in Ohio? Well, yes, it has been done. 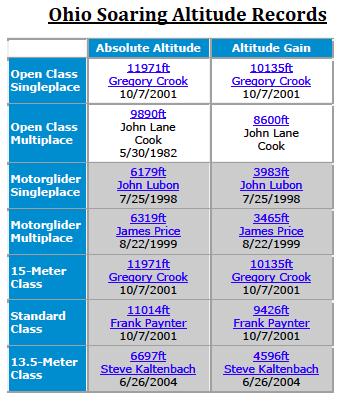 The table lists the altitude records for Ohio recognized by SSA. So, talk with John Lubon or Jim Price about how they would achieve nearly 3 times as much altitude gain as the records they currently hold for motorgliders. Rumor has it that some have equipped their gliders with full IFR instrumentation and attempted to ride a towering cumulus all the way to the top. A better approach might be to plan a trip to other locations in the US where wave flights are possible. To earn the Gold Badge you will probably choose to fulfil the altitude gain requirement outside Ohio. The newsletter reported the statistics for 1995. The club made 3547 flights. We did a lot more training in those days. The 2-33’s, 15H and 135 made 1191 flights. The private ships made 999 flights. The leading instructors were: Otto Maurer – 153, Jim O’Quinn – 145, Sidney Decker – 132 and JimHurst – 121. Leading tow pilots were: George Stillwagon – 397, John Antrim – 355, Dana Colvin – 299, Rich Carraway – 214 and Deiter Schmidt – 199. What minimum radio equipment is required for operation within Class C airspace? a) Two-way radio communications equipment and a 4096-code transponder. b) Two-way radio communications equipment, a 4096-code transponder, and DME. Remember that CCSC has a requirement that each member complete a CCSC Field Flight Review with a CCSC instructor and get the instructor’s endorsement in his/her logbook each calendar year prior to acting as PIC of any CCSC glider (UOP 4.2-Pilot Qualifications). Your first CCSC glider flight of the year must be with an instructor. Take advantage of the good spring days ahead to get the requirement completed well in advance of the great soaring that is sure to follow. You will want to spend your time soaring then, not waiting for your turn to do the Flight Review. Also, check your logbook. Do you need to complete the FAR 61.56 Flight Review this year? If so, why not combine the two flight reviews and get both completed when they will not interfere with the soaring you want to do during the great weather later this year.